Materials and technologies: injected moulding polypropylene base, solid laminate top. Colours: white, black, light gray and sand. “Defined by simple shapes and clean lines, the versatile Ikon family is now enlarged with a range of modular seating and new table bases that can be equipped with tops in larger sizes. 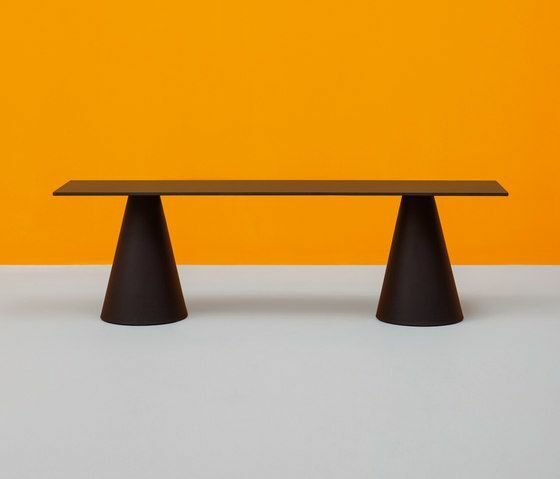 Suitable for indoor and outdoor use, the collection comes from the research of synthesis, beauty and functionality.” Ikon, indoor and outdoor table. Injected polypropylene table base, solid laminate, glass or powder coated steel top for outdoor use.Polypropylene and concrete ballast with adjustable feet available. Colours: white, black, light grey and beige.